Perhaps the most influential jazz pianist of the late 20th century, McCoy Tyner pioneered a forceful, swinging, and unmistakable piano voice that provided crucial harmonic texture to the legendary John Coltrane Quartet. Forging a unique sound that was driven by his powerful left hand, Tyner offered a harmonically open structure for Coltrane’s often modal improvisations and helped direct jazz’s evolution during the early 1960s. As his solo career developed, Tyner began to lead his own highly influential groups while also composing new standards for jazz and nurturing new generations of rising masters. Still actively performing today, McCoy Tyner has shown that he never sits still and is always finding and seeking new possibilities for this music. Tyner first met Coltrane in the mid-1950s at the Red Rooster in West Philly. He’ll be reunited with Trane in the Ertegun Jazz Hall of Fame. 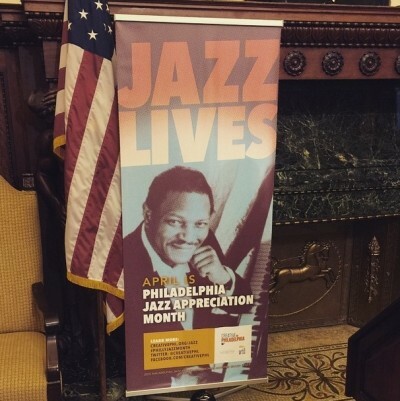 The 5th Annual Philadelphia Jazz Appreciation Month celebration is underway. 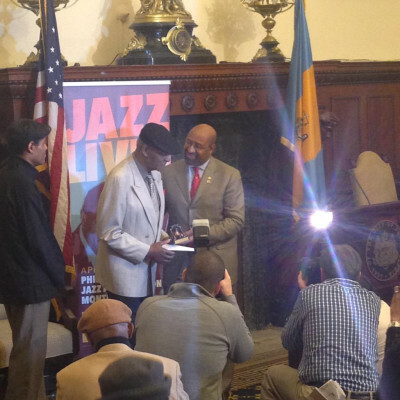 The 2015 Philadelphia Jazz Honoree is West Philly native McCoy Tyner, a four-time Grammy winner and NEA Jazz Master. Mayor Michael A. Nutter gave Tyner an inscribed Liberty Bell, the equivalent of the keys to the city. It’s wonderful to be back home in Philadelphia. I would like to thank the Mayor and the people of this great city for making this possible for me. No matter where I am in the world, Philadelphia always has a special place in my heart. For information about Philadelphia Jazz Appreciation Month events, visit www.creativephl.org/jazz. Tyner: Yeah the kitchen was . . . the living room-it wasn’t very big but it was right behind the beauty shop. And the beauty shop was a pretty large place because they had shampoos and they had these stations for people doing their hair. And then right behind that was that little small living room where we had the TV and everything. And then there was, after that, there was a kitchen, and then above all that were bedrooms upstairs; bed and bathroom upstairs. It was a nice location, and then my mother had to get in a cab to go any place. They drop her right downstairs (laughs) and that’s where my piano was. So sometimes-you know I had an R&B band in the beginning and we had jam sessions. I had quite a few jam sessions in my mother’s shop, and my mother would be doing hair and say, “Ah you guys go ahead play. It’s alright, it’s no problem”. So we would be in there and the ladies would be under the dryer patting their foot. … (laughs) a musical beauty shop! Brown: So, they’re sitting under those hair dryers patting their feet and you guys are jamming? Brown: Right in the same room. Tyner: Yeah, we were in the same room. She loved music anyway and she loved piano. I think she might have felt as though that’s what I was going to do. I think she saw the handwriting on the wall and so she didn’t discourage me. I took lessons and all that and I used to practice a lot. And then when I got the band, but she was very willing to let us go ahead and do our thing. That’s where I developed the skills of writing for other instruments. It is to McCoy Tyner’s great credit that his career after John Coltrane has been far from anti-climatic. Along with Bill Evans, Tyner has been the most influential pianist in jazz of the past 50 years, with his chord voicings being adopted and utilized by virtually every younger pianist. A powerful virtuoso and a true original (compare his playing in the early ’60s with anyone else from the time), Tyner (like Thelonious Monk) has not altered his style all that much from his early days but he has continued to grow and become even stronger. McCoy Tyner grew up in Philadelphia where Bud Powell and Richie Powell were neighbors. As a teenager he gigged locally and met John Coltrane. He made his recording debut with the Art Farmer-Benny Golson Jazztet, but after six months left the group to join Coltrane in what (with bassist Jimmy Garrison and drummer Elvin Jones) would become the classic quartet. Few other pianists of the period had both the power and the complementary open-minded style to inspire Coltrane, but Tyner was never overshadowed by the innovative saxophonist. During the Coltrane years (1960-1965), the pianist also led his own record dates for Impulse.